Sam Raimi's Evil Dead 2 is primarily known in its theatrical version. While the third film has numerous other versions out there, the second part has had a bootleg floating around that included some scenes that weren't in the movie. It's a little confusing as to whether other countries already got legal releases of that version (if you do know about it, drop us a comment, please, but it seems rather unlikely). Now, the first official release in Germany comes in two limited editions that have the film on DVD and Blu-ray in a remastered form. Also, a Blu-ray will contain this extended version which is approx. 2.5 minutes longer than the original version. Unfortunately, those additional scenes are not in HD like the rest of the movie but that shouldn't frustrate die-hard fans of the franchise. 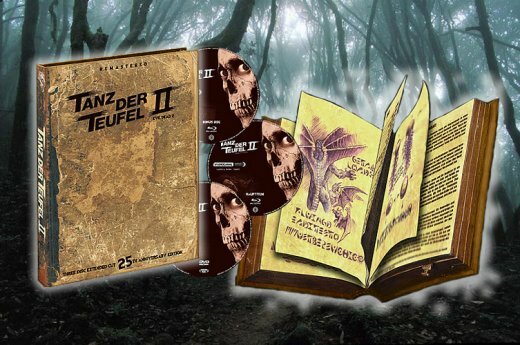 BMV Medien and StudioCanal will release both the 25th Anniversary Edition and the Wood Edition in Germany on September 24th, 2013. They will both have an English audio track so English-speaking customers might be interested, as well. The releases are very popular among German fans so if you really consider ordering one of these editions, better make it quick.